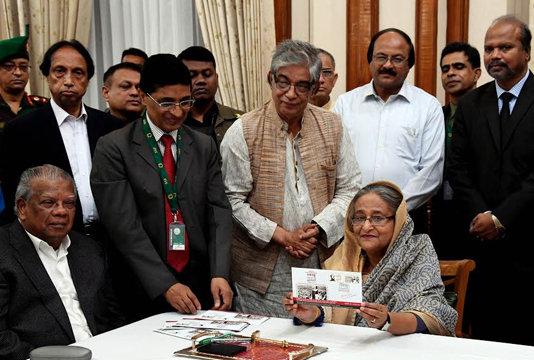 Prime Minister Sheikh Hasina released two commemorative postage stamps on Saturday, a first-day cover and a data card on the occasion of the celebration of golden jubilee of conferment of title “Bangabandhu” on Father of the Nation Bangabandhu Sheikh Mujibur Rahman. The premier released the stamps and the first-day cover of Taka 10 and the data card of Taka 5 at her official Ganabhaban residence on Saturday afternoon.A special canceller was used on the occasion. Post and Telecommunication and Information and Communication Technology Minister Mostafa Jabbar, PM’s Principal Secretary Md Nojibur Rahman, Post and Telecommunication Secretary Ashok Kumar Bishwas, PM’s Press Secretary Ihsanul Karim and Director General of Bangladesh Post Office Sushanta Kumar Mandal were present on the occasion, among others. The stamps, first-day cover and data card will be sold from Philatelic Bureau of Dhaka GPO today and those will be available at other GPOs and head post offices across the country later. On February 23 in 1969, the people of Bangladesh bestowed the “Bangabandhu” title on Sheikh Mujibur Rahman who later led the nation to gain independence through supreme sacrifices made during the Liberation War in 1971. The then Dhaka University Central Students’ Union (Ducsu) Vice President and Sarbadaliya Chhatra Sangram Parishad Convenor Tofail Ahmed announced the title on behalf of the people at a rally of a million people at the then Race Course Maidan (now Suhrawardhy Udyan) after Sheikh Mujib-subsequently the Father of the Nation-was freed from jail in the Agartala Conspiracy case on February 22, 1969.